Manakiki is rich in history. Its name is believed to be a Native American word for maple forest and was suggested by the predominance of maples along tree-lined fairways. The 200 acres were originally the summer estate of Howard Hanna, a prominent Cleveland industrialist. The property was then obtained by a group from the Willowick Club and converted into Manakiki Country Club. The Hanna Mansion was expanded into a beautiful clubhouse. In 1963, the east wing of the original Hanna Mansion, which mirrored the existing west wing was torn down due to a small fire and deterioration. The west wing was recently renovated to preserve its structural integrity and history. In 1944, the property owners, James and Fannie Brown, offered to donate the course to the city of Cleveland. The city graciously declined the offer and it was then sold to Cleveland Metroparks for one dollar, under the condition that it must forever remain a golf course. A plaque in honor of the former owners still stands near the18th green. 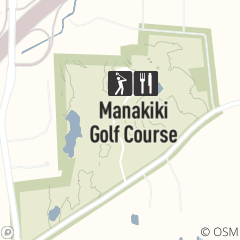 From 1944 through 1960, Manakiki was operated as a private country club. On January 1, 1961 after the country club's lease was not renewed, Manakiki was open for public play. Manakiki offers many great holes; #8 was considered the most difficult par 4 hole on tour in the '50s when Manakiki hosted the Carling Open. Hole #15 has also been selected as one of Cleveland's best par 3 holes. An electric trolley once carried golfers from the 15th green up the steep slope to the #16 tee. The mirror image canyon holes #10 and #18 are among the finest start and finish to nine holes in the country. In 1990, a master plan was developed to renovate the golf course and restore much of its original character. The plan included installing water and irrigation systems, building a pond on hole #3, and restoring a pond at hole #15. Tees were rebuilt or restored on holes 6, 8, 9, 13, and 15. A continuous cart path was also constructed to assure that golf carts may operate regardless of weather conditions. In addition, sand bunkers that were taken out will gradually be restored to their original state.